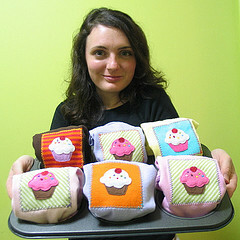 We interviewed Wonder Threads designer Diana Rodgers way back in 2006, but wanted to share this photo of her cute cupcake pillows, because you can now get them at the Brooklyn Indie Market, along with so much more (see their site for dates/details). See www.wonderthreads.com for info on buying directly from Diana. See also Brooklyn Indie Market's Flickr account. Brooklyn Indie Market is a collective of fashion and product designers. We provide a connection between emerging designers and consumers, retail buyers, stylists, personal shoppers and the press. Our aim is to connect one another and the greater NYC public to our traveling markets, fashion events, showcases, workshops and more in and around the New York area. We also welcome non-New York area designers who are interested in our mission. We launched the Brooklyn Indie Market website as a joint mission among independent Brooklyn-based designers to share information, learn from each other’s small business challenges, and to inspire and foster a community of creativity and authenticity. Our designers converge under the red and white striped tent on Smith & Union Street, offering the public a first glimpse of the many new names in fashion and product design. Diana Rodgers is one of our favorite designers at the market, not only because she makes the most darling kids and grownup tops (yes, with cupcakes on 'em) but it doesnt take a lot of eyelash batting to get her to bring her sumptuous, made from scratch cupcakes!